The Senate will hold a confirmation hearing on Wednesday for Oklahoma Atty. Gen. Scott Pruitt, who has sued the Environmental Protection Agency 14 times and is President-elect Donald Trump’s nominee to head that very agency. Pruitt’s nomination fits a disturbing pattern: Trump has selected several people for his cabinet and other top positions to lead agencies they have publicly opposed for years. Take former Texas governor Rick Perry, who campaigned for president in 2012 on abolishing the Dept. of Energy, for Energy secretary; Betsy DeVos, who has called traditional public education a “dead end” and has spent decades pushing public vouchers for kids to attend private, religious schools, for Education secretary; or Ben Carson, who besides having no housing or urban development experience is opposed to fair housing policy and the social safety net, for HUD chief. But in the running for the most egregious of these ironic picks is Pruitt, who in his nearly two decades as a politician has proven his unflinching allegiance to fossil fuel companies and utter distaste for environmental regulation. As a key ally to dirty energy companies in charge of the agency that regulates them, Pruitt, if confirmed, will do everything in his power to weaken environmental protections and encourage fossil fuel development, which will hasten climate change and line the pockets of industry executives. Pruitt has gone out of his way to challenge the concept of climate change, calling it “far from settled” in an op-ed for the conservative National Review. In addition to casting doubt on the existence of climate change, Pruitt opposes investigations into Exxon and potentially other fossil fuel companies that knew about human-driven global warming decades ago but hid that information and misled the public. According to the National Institute on Money in State Politics, Pruitt has received more money—$276,000—from fossil fuel companies and their employees than any other industry except for lawyers and lobbyists, many of whom represent fossil fuel companies. Top corporate donors to his four most recent campaigns include Chesapeake Energy, Devon Energy, Koch Industries, Oklahoma Gas and Electric Company, ExxonMobil and Marathon Oil. These donations aren’t charity; the companies and their executives knew that Pruitt would serve their interests, so they invested in his campaigns for state Senate and for attorney general. 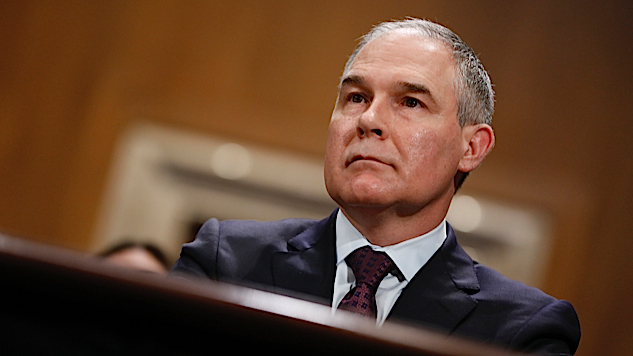 What’s more, Pruitt was chairman of the Republican Attorneys General Association, which spends money to help elect GOP state attorneys general and is substantially funded by fossil fuel companies such as Koch Industries, Murray Energy and Devon Energy. According to the Center for Media and Democracy, RAGA took in nearly $4 million from fossil fuel companies including Koch Industries in just the last three years. His 2010 attorney general campaign got a boost from the Republican State Leadership Committee, which is also funded by corporations, including fossil fuel companies such as Koch Industries. The RSLC spent $150,000 supporting Pruitt that year. The EPA nominee recently stepped down as chairman of a secretive “social welfare” nonprofit called the Rule of Law Defense Fund, established in 2014 and affiliated with the attorneys general group. The nonprofit brings together attorneys general “and other stakeholders” to attack EPA regulations. In 2014, the nonprofit accepted $175,000 from Freedom Partners, the “central bank” of Charles and David Koch’s huge, conservative political network, and $25,000 from the utility trade group Edison Electric Institute. Democratic senators sent a letter to Pruitt last month asking for answers about this covert group. Pruitt has also been involved with other shady outside political groups backed by fossil fuel companies and established to help him gain federal office. DeSmog created a detailed map of Pruitt’s fossil fuel ties, including his role with the American Legislative Exchange Council (ALEC), a right-wing bill mill that is funded in part by major fossil fuel companies such as Koch Industries and Devon Energy. “We should not have a fossil fuel puppet in the office directing the EPA,” said Democratic Sen. Jeff Merkley. The Oregon senator is right about Pruitt. The New York Times compiled the 14 times that Pruitt sued the EPA as attorney general of Oklahoma. In 13 of these cases, regulated energy companies and affiliated trade organizations including Murray Energy, Peabody Energy and the American Petroleum Institute were parties to the lawsuits, and most of these businesses were also contributors to Pruitt’s campaigns. Pruitt took part in cases challenging regulations concerning air and water pollution, Obama’s Clean Power Plan, and even mercury, a toxic byproduct of oil and coal energy generation that causes thousands of premature births every year. Pruitt has collaborated with industry lobbyists to craft positions taken by his attorney general’s office. In 2014, he sent an official letter to the EPA protesting a fracking rule that was written by a fossil fuel industry lobbyist, and he’s collaborated with Devon Energy lobbyists on numerous other comment letters to the EPA. In addition to benefiting from Koch Industries’ donations to his campaign and friendly outside groups, leading an ALEC task force and attending numerous ALEC meetings, Pruitt convened a “Summit on Federalism and the Future of Fossil Fuels” in 2013 at the George Mason University law school’s Law and Economics Center, a center funded by the Charles Koch Institute, DonorsTrust (to which the Kochs give million each year) and several oil companies. New York Times investigative reporter Eric Lipton tweeted that the meeting was “confidential” and aimed at strategizing to block Pres. Barack Obama’s EPA agenda. The program shows that attendees and panelists were fossil fuel executives, industry lawyers and attorneys general. GMU has received by far the biggest donations from Koch family foundations, including tens of millions of dollars each to two free-market think tanks and the law school, which is known for being deeply ideological. Doug Deason, a wealthy Texan and major donor in the Koch political network, pushed for Pruitt to become Trump’s EPA nominee. Wyoming Republican Sen. John Barrasso wrote a full-throated endorsement of Pruitt for Fox News, hailing Pruitt’s efforts to fight restrictions on greenhouse gases, methane emissions, water and air pollution. “As chairman of the Senate Committee on Environment and Public Works, I look forward to ushering in wholesale change at the EPA,” he stated. Trump’s potential administration, stacked with fossil fuel allies like Perry and the CEO of Exxon himself, is ready for a coordinated effort to maximize dirty energy profits and, as a result, destroy the environment. The president-elect’s energy plan includes harnessing “America’s $50 trillion in untapped shale, oil, and natural gas reserves, plus hundreds of years in clean coal reserves,” as well as encouraging natural gas and coal companies to operate on federal lands. He has pledged to get rid of Obama’s executive actions to protect the environment, open up currently blocked tar sands oil pipelines including Keystone XL, and to withdraw from the Paris Climate Agreement. Nowhere in this summary does Trump mention any form of renewable energy. Considering his record, Pruitt is sure to diminish the EPA’s power as much as possible in order to benefit the country’s biggest polluters and hand regulatory power over to the states, a majority of which are dominated by Republicans, who, in general, have been remarkably slow to acknowledge the overwhelming scientific consensus on manmade climate change. Democratic politicians and advocacy groups are vigorously opposing him, but if they’re not successful, we’re about to enter a very dismal time for the environment. Alex Kotch is an independent investigative journalist who specializes in money in politics. Follow him on Twitter.